This section is from the book "Illinois Wild Flowers", by John Voss, Virginia S. Eifert. Also available from Amazon: Fieldbook of Illinois Wild Flowers. Sweet on the air of an April evening is the. fragrance of wild plum trees in bloom. The scent carries everywhere through the woods and along the roadsides, wafts in great bursts of spring perfume, reminiscent of all the Aprils that ever were or shall be. There is the sound of cricket frogs jingling at the edge of the pond; the toads are trilling; the. first of the whip-poor-wills is back and the dusk is pulsating with its rapid call. It is an evening in April . . . there is the blur of white where the plum trees are in bloom, the softness of new grass under foot, the breath of soft air in the face, and the ineffable fragrance of wild plum blossoms in the nostrils. It is the complete essence of springtime distilled in that one nostalgic fragrance. 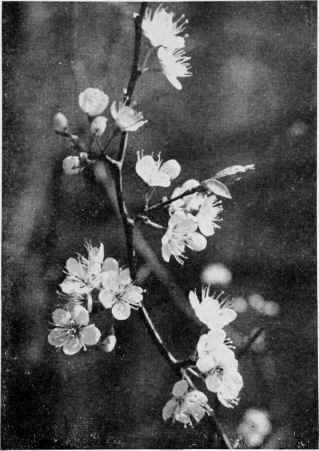 The wild plums blossom before there are any leaves on the gnarled black twigs. Now the tight clusters of small buds burst into bloom after a. soft April rain, and the trees are dripping with blossoms and perfume and raindrops. A phoebe whirs for a moment to catch an insect among the flowers. Next day when the sun is warm and the breezes blow, there is a soft showering of round white petals to the ground. Day by day the plum blossoms disintegrate until one day the small trees are covered with leaves and the perfume of April is gone for another year. By August there are oval, coral-red, or yellow-red plums on the trees. Few are perfect; most have small white larvae inside, larvae which were deposited as eggs in the ovaries of the flowers long ago in April. The plums fall, are pecked by robins. The stony seeds are gathered by chipmunks and wood mice and squirrels, who find the nut inside a toothsome morsel on a winters day.